(Nanowerk News) Researchers at the Helmholtz-Zentrum Dresden-Rossendorf (HZDR) and Forschungszentrum Jülich (FZJ) together with a colleague at the French Centre National de la Recherche Scientifique (CNRS) in Strasbourg have found a new way to electrically read out the orientation of magnetic vortices in nanodisks. Their method relies on measuring characteristic microwaves emanating from the vortices. The new knowledge about these signals could be used in the construction of extremely small components for novel memory technology or wireless data transmission. The results of the study appear in the current edition of the scientific journal Nature Communications ("Spin-torque-induced dynamics at fine-split frequencies in nano-oscillators with two stacked vortices"). 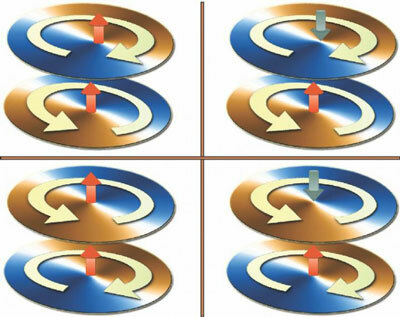 The internal spin configuration of magnetic nanodisks has been at the center of scientific attention for several years. "Spin" refers to the rotational momentum of charged particles that enables, among other things, iron to be magnetized, for example. The ferromagnetism of iron arises from the parallel alignment of the spins of all the electrons. However, in very thin and small disks of ferromagnetic material, the nanodisks, spins are also known to form magnetic vortices. Since researchers discovered these complex structures, they have been trying to use their properties to facilitate extremely compact and energy-efficient data storage. These nanodisk devices could, for instance, be employed in future smart phones or laptops, if the stored information can be read out successfully. In nanodisks, the spins - and thus the magnetic moment of the electrons - are arranged as if ordinary bar magnets were lined up in a circle. However, at the core of the disk, this order does not work anymore, and instead the small magnets align themselves out of the plane of the disk, either in an upward or downward direction. "With these two properties, the sense of circulation of the in-plane magnetization and the magnetic orientation of the core, information can be stored", says Dr. Attila Kákay, a former researcher of Forschungszentrum Jülich who recently moved to Dresden. "This means that we can store as much as two bits of information using a single vortex. Two vortices stacked on top of each other can already store four memory bits corresponding to 16 different states." This type of magnetic nanopillar with two stacked vortices is just 50 nanometers in height and has a diameter of 150 nanometers - almost a thousand times thinner than a human hair. But while the circulation of the vortex and the magnetic orientation of the core can be quite easily affected by currents and magnetic fields, the small size of the nanodisks was previously an obstacle to reading out the information. "The magnetic orientation in the core, the so-called polarity, could not be read reliably because the core was simply too tiny", says Dr. Kákay. However, during the course of experiments in Jülich, the researchers found a solution: microwaves. These electrical alternating voltage signals are emitted by the stacked vortices when connected to a direct current. The characteristic frequencies of the microwaves are now used by the physicists to determine the core polarity and sense of circulation of the vortices. "This principle is similar to that of playing a wooden flute: here too, each position of the fingers over the holes clearly corresponds to a particular musical note, a vibration frequency," explains Dr. Alina Deac, head of the Helmholtz Young Investigator Group for spintronics at the HZDR. With this new method, the scientists from Dresden, Jülich and Strasbourg have been able to design new nanoscale components that are not only capable of storing information within magnetic vortices, but also enable it to be reliably read out electrically. Using this principle, in the future far more data could be stored in ever smaller memory chips that could have many applications in modern electrical engineering. In addition, the frequency of the AC voltage can even reach the gigahertz range, which makes ultra-fast wireless transfer of information possible, for example, for use in mobile communications and wireless network services.